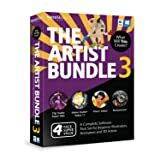 4 pack super value – over 50% off!A Complete Beginners’ Software Tool Set for Illustrators, Animators and 3D Artists. CLIP STUDIO PAINT PRO (FORMERLY MANGA STUDIO 5) is your all in one solution for stunning, ready to publish Manga and Comics. Bring your artwork to life using color, express motion using speed lines, apply dimension with screen tones and add dialog through built in word balloons. Anime Studio Debut 11 is the complete and easy 2D solution for creating cartoons, anime or cut out animations. Make your own animations for film, video or sharing online. Now you can make 3D art, even if you don’t have an artistic bone in your body. Build a scene on the Poser Debut virtual stage; then add, pose and animate over 70 included characters to make cool images and videos. MotionArtist is everything you ever wanted to develop amazing interactive comics, robust animations for web or video export, and compile incredible multi-media presentations. Simply import your images, audio, or video and utilize MotionArtist’s powerful, easy, and intuitive toolset to create ambitious motion creations to share with the world.